Sadie, a mini-donkey rescued by the Pennsylvania SPCA in January, gave birth to a baby mini-donkey on Sunday, May 7, 2017. The animal-welfare agency held a contest to name its newest friend. Sorry, Philly, you won’t have a Li’l Sebastian of your own, after all. 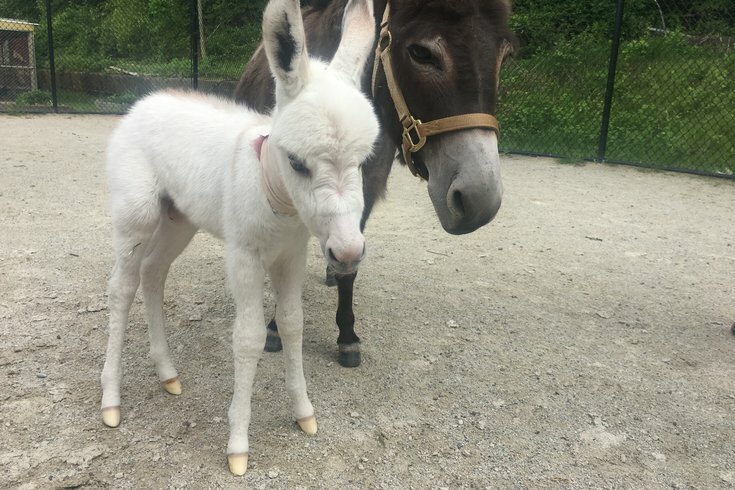 It’s been just eight days since the Pennsylvania SPCA announced a contest to name the baby mini-donkey born to Sadie – who was rescued from an abandoned Huntington County farm in January – on May 7 at the agency’s local shelter. The baby donkey already had some time in the limelight. Cameras were installed in Sadie’s barn near Erie Avenue since they didn’t know exactly when she’d give birth. Well, when she did, the PSPCA devised a clever way to draw attention – and raise medical-care funds – for mother and daughter mini-donkey. For a $5 donation, folks could choose between five names for their newest friend. They were Georgie, Van, J.R. (Romeo Jr.), Lucky and Lil’ Sebastian. As previously noted on this site, I hoped the latter name would win. As first noted on this site right now, though, I regret to inform you that the majority did not agree with those sentiments, thus blowing a perfect opportunity to honor the fallen “Parks and Recreation” star. The vote was supposed to end after a week, but on Tuesday, just one vote separated Georgie and R.J. atop the standings. (Li’l Sebastian was in third with 121 votes). Within 24 hours, the final result was revealed. Per the PSPCA’s director of public relations, Gillian Kocher, Georgie bested R.J. by three votes (136-133) with Li’l Sebastian coming in third (124). While the results may come as a disappointment to some, there is a silver lining, even beyond the $4,000 raised through the contest. "'Georgie' is 100 percent in honor of George Bengal," Kocher said of the longtime face of the PSPCA's humane law enforcement effort who died last year after a battle with terminal cancer. "It's so appropriate given the (Night for George fundraising) event this weekend."